So… the Fawn, is it any good? Yes of course it’s good, did you really expect me to say anything else 😉 I’m a Linux fanboy at heart. I had some issues upgrading my previous installation of Edgy to Feisty as suggested on the Ubuntu site, it failed twice and I wasn’t happy. To be fair to Canonical I think it was more to do with my weird setup than their updater, I know other people who used it and it worked first time for them. I have a lot of unusual development packages on my system and that seemed to cause the problem. The main offending package appeared to be the Python Imaging Library, it caused the updater to error twice and then inform me that my upgrade had failed. I seem to remember compiling this package from source while doing some work on Django, maybe that had something to do with it I’m not sure. KERNEL PANIC: apic sync error. Try booting with ‘noapic’ option. After that I could go to “Applications / System Tools” on the menu and access the config tool (pictured below). After a quick run of Automatix2 which is not popular in some corners of the Ubuntu community (I’m not getting into that), my Feisty system was ready to go. Despite a few problems getting the system installed I’m very happy with my new OS. I can’t say I’ve noticed a massive amount of difference from Edgy but I’m sure things will be become apparent as I use it more. It’s still new. I keep my “/home” directory on a separate partition to the system root and it turned out to be a real bonus for me. When I formatted my root and reinstalled I left my home partition alone and found that all my desktop and application settings were preserved for me. This was great, I didn’t need to spend any time setting up my new system, it was already done. How cool is that? So what do I really think of Feisty Fawn? 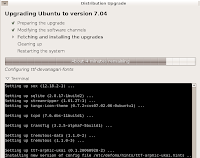 If I’m honest I’m a little disappointed but only because I expect so much from Ubuntu. They’ve set the bar really high, I was surprised that my video drivers and NTFS drivers weren’t automatically set up in the install. 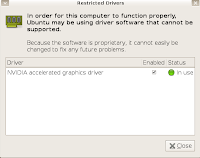 I expected a prompt saying “You have an Nvidia video card, do you want to use the restricted driver?” but instead I had to set that stuff up afterwards. Ok it was easy to do and didn’t take to long but I think they could still do a bit better. Make the restricted driver manager more prominent at least. Overall, Feisty is a great OS and I would recommend that everyone try it. The problems I experienced were basically down to the quirks of my system and shouldn’t really reflect badly on the OS. I suppose I just expected to see more differences from Edgy but in the end perhaps that’s not such a bad thing. Its definitely as good as Edgy and there’s no better compliment I can give than that.